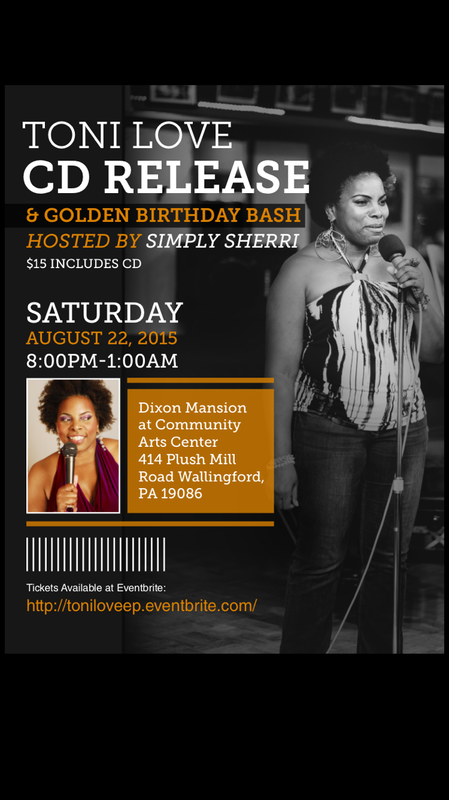 Celebrate My First Poetry CD Release and Birthday, August 22nd! I am so excited..in a little over a month I will be presenting my first poetry CD to a room full of friends, family and fans and I can’t wait to share this moment with everyone! It has been quit an experience from the first recording to working with a Producer, registering the tracks for potential royalties and copyrite, deciding on the cover art and planning the release party. I’m exhausted just thinking about it! I’m so thankful for all who have contributed to this project through my Go Fund Me account because none of this would have happened without their generous support. Thank you! I am humbled by all of the family and friends who have encouraged, advised and supported me and I hope that you will not be disappointed. It will also be my golden born day celebration so I have so much planned for the night; live music by Moka Soul, special invited poets, Visual Artist Terrill Johnson, of course my own performance and a DJ to close out the party. The evening will be hosted by the poet Sim Ply Sherri and I promise you will have lots of fun. Wine and beer will be available for sale and there will be a private VIP reception. All of this will take place in the main Gallery of the Community Arts Center in Wallingford, PA (see flyer for address). Some out of town guests plan to stay at either the Loews Hotel or the Marriott Hotel in Center City Philadelphia so that they can enjoy the city before and after the party. You don’t want to miss this fun! I hope to see you there! #loveistheanswer! This entry was posted in Gifted and Talented, Health and wellness, Life After 40, love, Passion, Poetry, Recreating yourself and tagged arts, August events, CD Release, Community Arts Center, Dixon Mansion, EP release, live poetry, Love, love poems, loveistheanswer, philadelphia poet, philly, Philly open mic, Philly poet, Poem, poetry cd, poetry EP, recreating yourself, Release party, the restoration, Toni Love, Toni Love Project, wallingford pa. Bookmark the permalink. 2 Responses to Celebrate My First Poetry CD Release and Birthday, August 22nd!